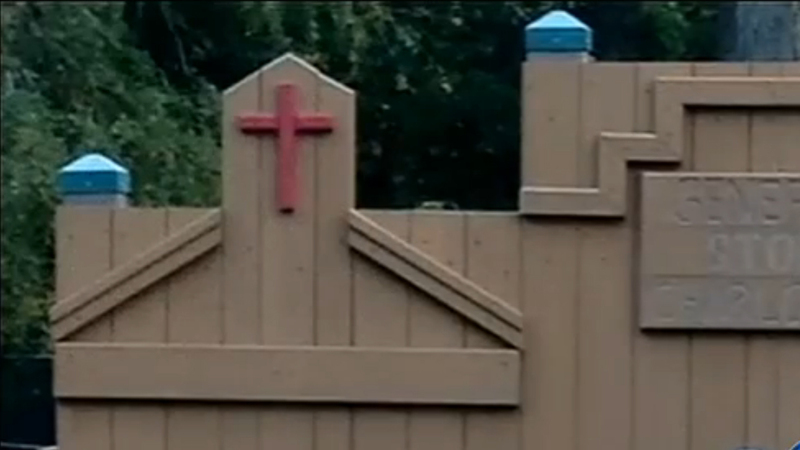 Pineville, NC -- Mecklenburg County removed a small cross from a public playground after a local mother complained it was offensive -- a decision that has prompted strong opinions from both sides. Channel 9 reporter Joe Bruno spoke to county officials who said it was a mistake to put it up in the first place. The park was built in honor of the children killed in the Sandy Hook massacre in 2013 and was designed by kids locally at Pinewood Elementary. One thing that slipped through the county's review of the design was the general store, and the county removed the cross Monday after a parent complained. County officials said the woman is Jewish and felt uncomfortable with a Christian symbol in a public park. County leaders are calling the cross an oversight and said it was never meant to offend.